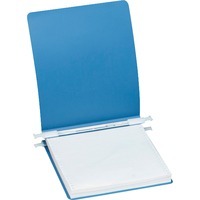 Data binder is made of tough, flexible, poly cover that will not rip, fray or crack. Material is water resistant and soil resistant. Data binder features 6 capacity steel posts and slide hooks for single point and drop filing. Top loading and bottom loading design works for unburst sheets and multiple punched holes.